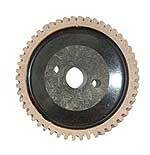 Lminated timing gear for the model A or B engine. These gears are made out of a laminated material instead of a maserated material. These are a stronger gear. Aluminium timing gear for the model A or B engine. When running an overhead valve set-up or if you just want a bullet-proof gear, this is what you need. Modern Camshaft nut for the 1928-34 Model A and B engine. 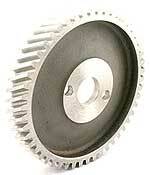 This is a modern style nut that holds the cam gear onto the end of the camshaft. This style has a 1-1/4" hex machined onto it so that special tools are not necessary. Camshaft nut 1928-34. Most mechanics take this nut off with a punch and hammer. So you will find a lot of damaged nuts. Check to make sure the nut is not bent. Made in USA. Special tool for removing and installing the A-6259 cam nut on the Model A Ford engine. Made in USA.